Sister Serendip: Five on Friday: One Month Done! Five on Friday: One Month Done! Somehow one month of the new year has already passed . . . so how are those resolutions going? I understand the backlash against resolution-making; too many people choose unrealistic goals and then unsurprisingly give up on them. 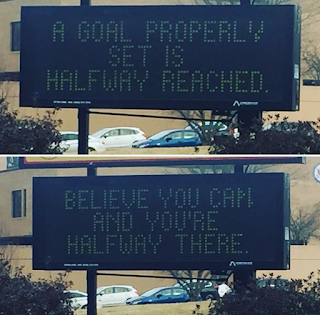 As this sign in front of the High School says, a goal properly set is halfway reached. 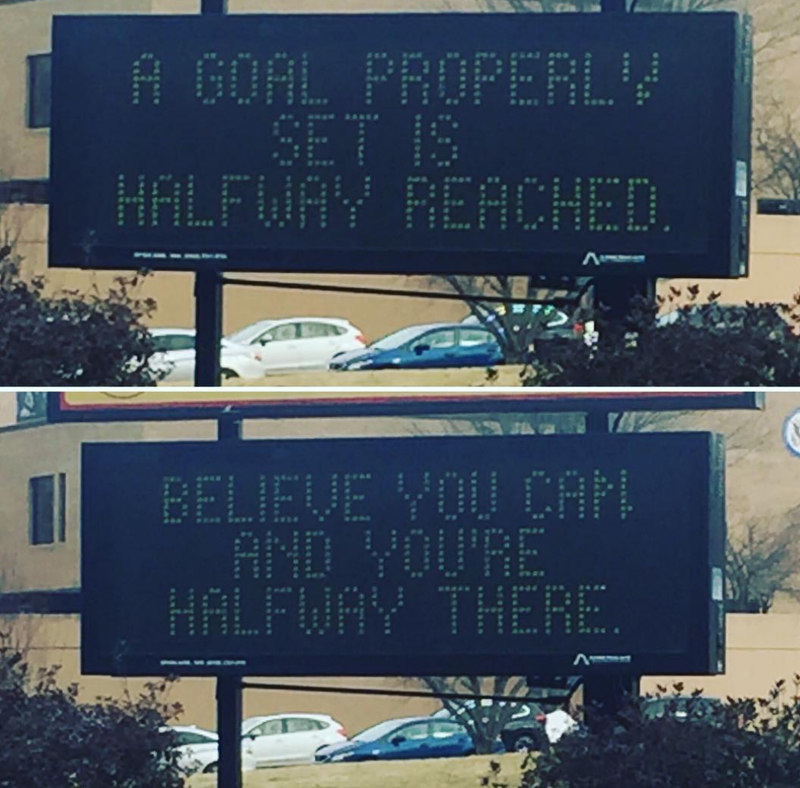 It also says that if you believe you can you're halfway there! We've been debating if that means all you have to do to realize your dreams is set a proper goal and then believe you can do it. I tend to set little goals for myself throughout the year as needed. When the year is brand-new and the weeks of holiday craziness are finally over, it always seems like a good time to make a few more. So I guess that makes me a resolution maker. 1. Health: Meh, last year was annoying for me, health-wise. Nothing serious, just a bunch of time and money spent to more or less conclude that this is me as a middle-aged woman and that I'm going to have to make some adjustments. Weekly goals in this department include meal planning and flossing. It's going pretty well, now I just need to get the kids to floss, too. Oh and I need to make our dentist appointments. That will be February's goal. 2. Relationships: With such a large family and so much keeping us busy all the time, it's hard to get valuable time in with one another. It's idiotic to not prioritize this, life is too short not to. I can't spend one-on-one time with everyone I'd like to every single month (properly set goals!!) but I'm trying to make sure I get on dates with my husband, spend quality family time together, see friends and extended family . . .
3. Self-Care: Closely tied to 1 & 2. Exercise, naps, seeing friends, doing my nails, etc. I had a massage yesterday and I am sure the masseuse was appalled by the tight and knotty state of my upper back. In February I aim to horrify a nail technician with my rough winter feet. 4. Creativity: I hadn't been writing much recently but something clicked the other day and I was happy to get out an essay I feel good about it. February goals include some more writing and finishing the family video of 2017. 5. Community: January's an easy one in this department because of Martin Luther King Day. Other months won't be such massive undertakings . . . however, because of this year's MLK Day, I've made some new partnerships with other groups and individuals that would like to do more community service events. I'm also planning a Sexual Assault Awareness Month event with my social justice theatre troupe. That won't be held until April but the planning of it might fulfill this goal for February. Anyone else out there make any resolutions that they're still holding strong to? Remember, believe you can and you're halfway there!